HDSA Elementary Peer Group is excited to offer a new session of Sportball this fall! Please view this flyer for more details. Because of the wide age range of participants, parents are encouraged to challenge their child according to their skill level and stage of development and not to compare their child to others in the class who are more experienced and have a longer attention span. Please approach the coach at any time to tailor the drills to your child's skill level as necessary. Please note that due to the nature of this activity, siblings are not permitted to participate. Siblings are welcome to attend and watch from the sidelines. Feel free to contact Laurie or Sarah to discuss further if necessary. If you are interested in having your child participate, please email Laurie Mendoza to secure your spot. Also, please attach this registration form and return to Dana Ebidia at the email address provided. This is a reminder to all those interested in taking advantage of the Support bursary that the deadline for applications of intent to participate are due on September 30th. This application is necessary to help the Board budget funds for this bursary. Completion of this application in no way obligates you to take advantage of this bursary. Please complete the application form and submit it to Anu Prakash by the end of the month. Attention Graduates: Please complete your own application found here. 1) The creation of two tiers of support - those completing between 10-19 hours of volunteer work for HDSA are eligible for up to $800. Those completing more than 20 hours are eligible for $1600. 3) An expanded list of qualifying activities, therapies and equipment. The new policy is just being polished off and should be on our website soon. Please contact Lori Sheppard with any questions regarding the new policy. The Elementary Age Group would like to invite you to our IEP (Individualized Education Program) Seminar on September 29th at 7PM. The Seminar will take place at the Alton branch of the Burlington Public Library. The seminar will share important details about IEPs and the parents' role in the IEP process, the IPRC, placement options for students with special needs, as well as Accommodations, Modifications and Alternative program areas. This seminar will be suitable for parents of elementary students and parents of children who will soon be entering the school system. We are extremely lucky to have Dianna Bower, Lori Aker and Dan Hotopeleanu share their exceptional knowledge and experience of supporting and advocating for students with special needs in both the Public and Catholic School Boards. These incredible advocates have represented our community well for many years! This is a great opportunity to learn from their wealth of knowledge! This one is not to be missed! If you are interested in attending this seminar, please contact Sarah Gale at sarah@haltondownsyndrome.com. Looking forward to seeing you! Diana served for close to 9 years as the SEAC Rep for the HDSA until she was elected Trustee for Burlington Wards 1 & 3 for the Halton District School Board in 2010. During her time as the SEAC Representative for the HDSA, she also served as Vice-Chair and Chair of SEAC. Dianna also sat on SEAC as a Trustee SEAC Representative until the end of her term November, 2014. She has just been voted back onto SEAC as the Alternate SEAC Representative for the Halton Down Syndrome Association. Dianna has been a speaker at the DSAO Conferences of 2010 and 2013 regarding Special Education Advisory Committees, Special Education and IEPs. She has also trained SEACs and spoken about special education at the HDSB Parent Involvement Committee Conferences. Dianna has also supported the Down Syndrome Association of Ontario through the writing of position statements and letters to various ministries as well as represented the DSAO at stakeholder consultations with regards to special education funding and school health support services. As a SEAC Representative, Dianna has been involved in stakeholder consultations at board level as well as ministry level with regards to “Planning Entry to School” and the Best Start Program as well as Individual Education Plans. Lori sat on the HDSA Board of Directors for 5 years in various roles, slowly moving more towards advocacy and becoming liaison between the HDSA executive and our SEAC representatives at both school boards. She then moved on to become a member of SEAC at the HDSB and is now in her fifth year. Lori has represented DSAO at the provincial review of School Health Support Services, and written several letters to the Ministry on behalf of HDSB SEAC. Lori's passions include working towards the full inclusion of individuals with intellectual disabilities, protecting their right to meaningful education, and empowering parents to be confident and effective advocates for their children. Dan is currently in his third year as the HDSA SEAC Rep for the Halton Catholic District School Board. He is passionate about improving communication between parents and school. He believes that if all sides have an intimate understanding of details and circumstances, possibilities and concerns, that all children will benefit. Dan is also interested in technology, which he believes will provide the best return on investment throughout the education journey, particularly for children with special needs. The DSAO Conference 2015, "Get Connected", will be held at Horseshoe Valley Resort in Barrie, Ontario. For full conference details, please check out the conference package. Please Join us for a Summer Picnic! We are having a Graduate Group Meeting at Allan's House on Tuesday, July 28th from 7-9pm. This will be a social gathering and parents are welcome! Along with hanging out and chatting with one another we do want to discuss some ideas for the Graduate Group for the remainder of the year and going forward. We hope you can all make it! When you arrive there is a security gate. Just tell them you are there to visit Allan! Once you park and enter the condo, dial 3434 and Allan will buzz you in. The unit is 101. Our first Go21 - Halton Walk for Down Syndrome was a huge success. The weather was outstanding, the venue perfect and the entertainment a blast! Early estimates have funds raised at over $100,000!! These funds will go directly towards helping our family members living with Down syndrome. We were amazed at the media response, and proud to have articles and photos in the Metroland papers and on Cogeco TV this year. We also had a record number of attendees (1200!) which is amazing, as we continue to strive to raise awareness of our organization and its role in the community. Thank you to Kathy Tovey and Maddison Gilmour, our Volunteer Coordinators, for making the event run as smoothly as it did. Thank you Judy Coombe, Siobhan Chirico Judy Moore and Carol Burnell for organizing the phenomenal silent auction - what a haul there was! Thank you to Lauren Hughes and Carinta Mannarelli who smoothly ran the registration tent - thanks for keeping us all organized! Thank you to Jessica Pereira and Shannon Sutton who coordinated the T-shirt orders and created our sea of blue and white! Thank you Adelle Purdham, our Media Coordinator, who helped advertise our event and drew in so many new people! Thank you to Mandy Chalmers, our Carnival Coordinator who ensured everything ran smoothly - our kids sure thank you! Thank you Lori Sheppard for all of the hard work and help behind the scenes! Thank you Carol Fozo, JP Fozo, and Laurie Mendoza for keeping us all watered and fed at the BBQ. Thank you Alexandria Smith and crew for the amazing face painting and tattoos! Thank you to Mary Lisi, Kerri Kawaguchi, Kim Daponte, Kaitlyn Brown, and the Graduates for writing the thank you cards and for incredible support on the day of the event. Thank you to Heather Wray for keeping our members informed through wonderful proour Social Media networks and for updating our HDSA website to include Go21 information. Thank you Luke Yourkevich and DMS for once again providing the DJ and MC services - this is an outstanding and much appreciated donation of your time and efforts! We'd also like to thank Darryl Sittler for his support at this event. The Have a Heart for Down Syndrome Foundation was incredibly helpful in securing sponsorship and many of our silent auction items. A special thanks to Joyce Furlane and her crew for all of their work in getting donations for the silent auction, and to Peter Smiechowski for securing several of our corporate sponsors. A huge thank you to all of our generous sponsors and to our two platinum sponsors, Shannon McCrae, Desjardins Financial Security and Bridging Finance! There are so many other volunteers who made this day such a huge success. So, to all of you who spent countless hours at meetings, pounding the pavement in search of items for the silent auction, shopping for the BBQ, coordinating the entertainment for all to enjoy, and so much more, thank you so much and please know your help was so very much appreciated. Finally, we would like to send a huge thank you to our entire membership for participating in and supporting the event. The donations that each and every one of you brought in, will enable HDSA to continue focusing on events, activities and initiatives to better the lives of our loved ones with Down syndrome. Believe it or not, planning is already underway for next year’s event. We need people willing to take on Chair positions for the major components of the day. Please contact Jen Thomas or Leanne Tovey if you will be willing to help organize this event for 2016. Thank you to everyone from the bottom of our hearts! Join the New Parent Group at four Splash Pad dates throughout Halton this summer! As the sunny, warm days have finally arrived, we are excited to announce our summer outdoor play dates that are scheduled over the next two months. Each play date will take place at a Splash Pad in the Halton area. You and the whole family are welcome to join us for some fun in the sun! The Splash Pads are open to the public on these days, but look for our HDSA tent to find our group! 2. 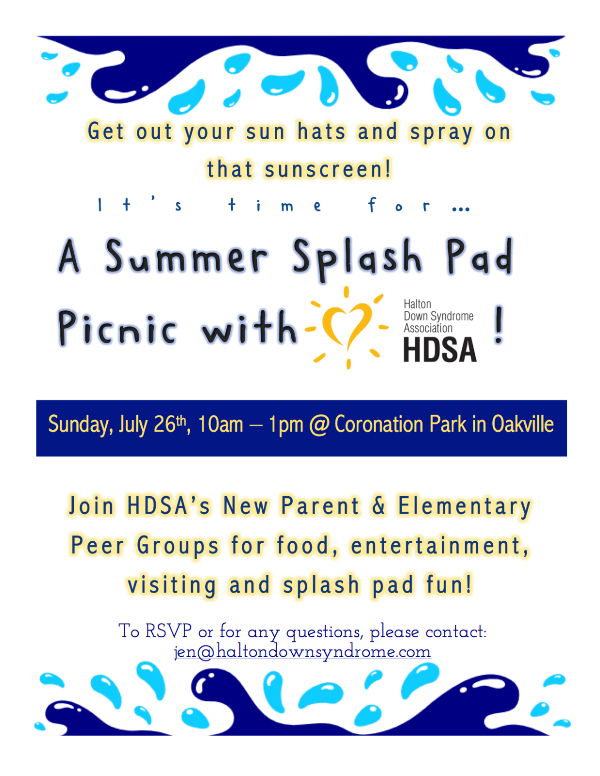 Sunday, July 26th, 2015 --> 10:00am - 1:00pm @ Coronation Park in Oakville (1426 Lakeshore Road, West) *This will be a special summer picnic for our New Parent Group! All families are welcome to come and enjoy a picnic lunch provided by HDSA - please RSVP to jen@haltondownsyndrome.com so that we can determine how much food to bring. Looking forward to enjoying some sunshine together, catching up and watching our little ones play together! Community Living Burlington is offering a 10-week Work Skills Development Course for adults who have a developmental disability to develop and build on existing skills to meet the three main qualities employers look for in employees: Motivation, Reliability & Dependability. There will be an in-class component and a practicum to assist students to explore the world of work! For more information click on the link below. If you are not interested in attending in Burlington please check with Community Living North Halton and Oakville as they likely have similar programs.